The Spectroline® ultraviolet quartz pencil lamps cannot be beat for their small size, light weight and long life. They’re ideal for the widest range of applications. 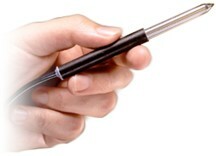 In fact, these features make Spectroline pencil lamps the most useful and versatile UV light sources of their type. Spectroline quartz pencil lamps are small, low-pressure, mercury-vapor discharge lamps made of double-bore material with both electrodes at one end. They are very stable lamps, when used properly, and maintain a high output of ultraviolet radiation over thousands of hours. This long life and stability is especially important to instrument manufacturers incorporating these lamps into their equipment. 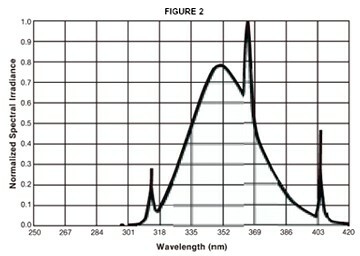 Spectroline pencil lamps have a spectral emission characteristic of a low-pressure mercury discharge consisting of many well-separated lines in the ultraviolet, visible and infrared parts of the spectrum (see Figures 1 and 2). They are widely used as spectral calibration sources in spectroscopy, chromatography and photometry, and a multitude of other laboratory and industrial applications. Average Intensity — 4,500 µW/cm2 of 254nm (2537 A°U, 254mµ) radiation at 1" (2.54cm). Housing — The quartz tube is bonded inside a phenolic handle with Viton™ and a special insulating resin. 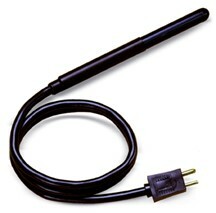 A 24" (61cm) ozone-resistant cord set with plug is provided for attachment to the Spectroline SCT-1A power supply. Dimensions — The lighted length of the tube is 21⁄8" (5.30cm), 1⁄4" (0.65cm) OD. The handle is 3⁄8" (0.95cm) OD and 5⁄16" (0.79cm) ID. The total length of the lamp housing is approximately 5" (12.7cm). Operation — The lamp plugs into the Spectroline SCT-1A power supply. Net Weight — 2 oz. (60g). Light Shields — The 11SC-1 lamp is available with A, B and C shields as options (See Accessories). Average Intensity — 2,000 µW/cm2 of 254nm (2537 A°U, 254mµ) radiation at 1" (2.54cm). Housing — Same as 11SC-1. Dimensions — The lighted length of the tube is 3⁄4" (1.91cm), 1⁄4" (0.65cm) OD. The total length of the lamp housing is approximately 31⁄2" (8.9cm). Operation — Same as 11SC-1. Net Weight — 11⁄2 oz. (40g). Light Shields — Not available. 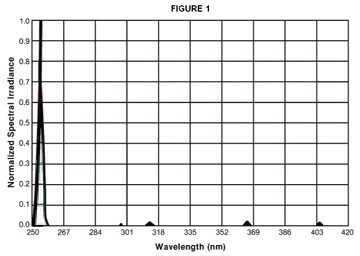 The Spectroline 36-380 pencil lamp is one of the smallest sources available of filtered, long wave ultraviolet (Black Light) radiation. It is basically the 11SC-1 lamp coated with conversion phosphors that absorb the 254nm line and convert this energy into a band peaking at 365nm. The lamp in encased in a tubular glass filter that absorbs visible light while transmitting maximum ultraviolet intensity. The 36-380 lamp is ideal for fluorescent penetrant analysis and boroscopic inspection in ordinarily inaccessible locations. Average Intensity — 1,000 µW/cm2 of 365nm (3650 A°U, 365mµ) radiation at 1" (2.54cm). Dimensions — The lighted length of the tube is 21⁄8" (5.30cm), 3⁄8" (0.95cm) OD. The total length of the lamp housing is approximately 51⁄4" (13.34cm). Net Weight — 21⁄2 oz. (70g). EPS-100 Series is used with 11SC-1, 11SC-2 and 36-380 Pencil Lamps. EPS-110 Series is used with the 36-380/10A Pencil Lamp, whose arc and cord are longer. 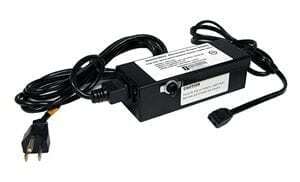 These electronics power supplies have been engineered to operate all Spectronics’ UV Pencil Lamps. Light Shields for 11SC-1 Pencil Lamp Light shields are available for the 11SC-1 lamp with different apertures for directing the light source. 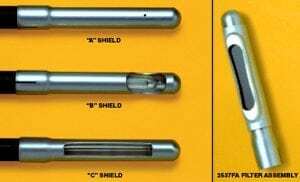 Shield A has a 0.04″ (0.10cm) ID drill hole and is used where point emission is desired. Shield B has a 5 ⁄16 x 5 ⁄8” (0.79 x 1.59cm) window and is frequently used as a source shield for interferometers. Shield C has a larger window, 3 ⁄16 x 11 ⁄2″ (0.48 x 3.81cm), and is widely used in calibrating spectrophotometers. Optical Filter — No. 2537FA Short Wave Filter Assembly for 11SC-1: Special filter and shield assembly that slips over tube of 11SC-1 lamp. Absorbs visible light and transmits 254nm radiation.